Data is stored in an enterprise geodatabase. ArcObjects components are used to develop custom data loading programs. Cartographic label positioning is now fully automated. 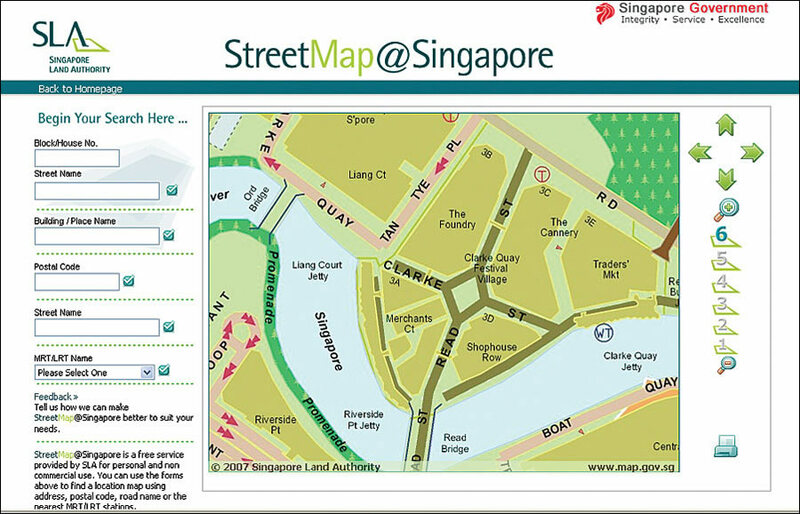 Since 1954, the Singapore Land Authority (SLA), through the former Survey Department, has been publishing a comprehensive Singapore street directory (SD). That inaugural edition contained street names, major building names, and street maps. One of SLA's two new e-services is this easy-to-use online street directory of Singapore where the public can search for locations of interest using various types of searches. Until 1995, SD was prepared manually using hand drawings on transparency material. After 1995, it was converted to a digital format using CAD software. While an improvement on manually creating the directory, this required each page of the SD, with all the different features, to be stored in its own individual CAD file. Managing so many files was cumbersome. Edits to the data could only be made by one technician at a time. After digitizing and editing, a black-and-white hard copy for each SD page was printed and provided to the publisher. The publisher then scanned the hard-copy maps, painstakingly filling in every feature with the appropriate colors. The indexes to streets and places were manually entered in worksheets or textual files. Lastly, normal printing procedures were followed to produce the book. All this manual labor necessary for data capture, maintenance, and publication required a large staff pool. The various software environments and tools raised overhead costs. To overcome these obstacles, SLA developed stand-alone utilities and programs in-house for data conversion, transformation, and loading. However, development and maintenance of these diverse utilities were challenging, since they required SLA to employ specialized technical manpower. In addition, transferring data from one software environment to another resulted in data losses. To optimize this workflow, SLA wanted to find a comprehensive solution that had rich cartographic capabilities and was easy to customize, while also eliminating the need to transfer data between software environments. After evaluating software products available in the market, SLA found that Esri's GIS software solutions were able to meet these requirements and implemented the ArcGIS suite of software to maintain the SD data. SLA created an ArcGIS software-based Geographic Data Management System (GDMS) to perform the cartographic work. By using ArcGIS for the SD, SLA no longer needs to outsource cartographic work. Data is now stored in an enterprise geodatabase, a data storage and management framework that supports all the different types of data used by ArcGIS. The geodatabase is accessed using ArcSDE with Oracle serving as the underlying database. "The geodatabase is very useful, since it facilitates versioning and multiuser editing features, enabling our technicians to perform concurrent editing," says Chim Voon How, director of the Information Technology Division of SLA. SLA also developed custom data-loading programs using ArcObjects, a modular, scalable, cross-platform set of programming libraries specifically for ArcGIS and .NET. The data-loading programs use complex validation rules while facilitating data and updates from various sources. ArcSDE also helps define several cartographic rules at the database level, such as the need for bridge symbols to always appear over roads, canals, or rivers. ArcGIS is able to perform on-the-fly projections, and SLA applies this to many database queries to refine map displays at different scales. This helps to control representation of a feature at different scales and enhances the presentation and print quality. For example, minor roads appear on a map scale of 1:2,500 and disappear at the 1:7,500 map scale. Label positioning, once one of the most time-consuming aspects of map production, is now done with Maplex for ArcGIS, Esri's fully automated cartographic name placement software. Once all the cartographic activities are complete, SLA uses a custom-built Mapbook creation tool based on ArcObjects for the SD pagination. Different areas of Singapore have different feature densities; this tool helps to generate map pages at various scales based on a spatial GRID layer. The map pages are then exported by the Mapbook utility into PDF format, which is then passed to the publisher for the final printing work. SLA has found that this integrated workflow in ArcGIS supports everything it needs, including capture, editing, and updating, as well as streamlining its operations. Today, the data is maintained in seamless GIS layers that show the entirety of the island of Singapore. ArcGIS allows a multiuser editing environment, meaning users can work on the same data without affecting each other's work. "This is a big improvement compared to the days of our CAD-based system, where data had to be divided across many smaller files and only one person could work on a file at a time," says How. Before the implementation of GIS, high cost and effort were needed to perform operations like manual coloring of road casings, buildings, and parks and generating indexes for roads and places. Thanks to the GDMS, data is now organized and managed more efficiently. Since the system facilitates multiple validation checks, most of the human errors are eliminated. Using the latest ArcGIS features, such as feature-linked annotations and topology validations, the data maintenance effort has been reduced. Indexes to roads and places are now generated using GIS spatial query functions, and all manual data entry work has been eliminated, which greatly reduces human data entry errors. SLA found the spatial and attribute query functions useful in the data verification and quality control work. Today, only the final publication work is outsourced. The SD is now published annually, a much easier task to manage with ArcGIS. 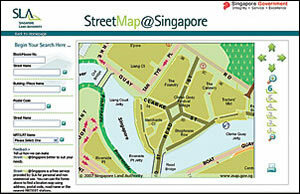 SLA implemented two new e-services for public consumption as spin-offs to the SD maps. The site, www.map.gov.sg/landquery, allows members of the public to obtain landownership information for any land parcel. It also provides contact details for the land owned by government agencies so the public can contact the agency for temporary leases or to report incidents, such as fire or mosquito infestation, on government lands. The other e-service is an easy-to-use online street directory of Singapore, where people can search for locations of interest using various types of searches. Both e-services were deployed using the ArcGIS Server platform. For more information, contact Anupam Mukherjee, manager, Singapore Land Authority (e-mail: mukherjee_anupam@sla.gov.sg, tel. : 65-6325-1560).